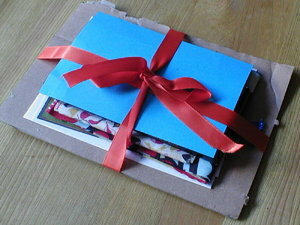 I nearly exploded with delight when I opened this lovely package from Jennpal - a Martha Living Magazine. I just love this magazine, I wish it was available over here. Maybe I will have to splurge on a subscription and get it shipped over. I've flicked through and it is packed with fab ideas and things to do. She also send me a Woman's Day mag, I haven't seen this before. It is full of lovely recipes. Thanks so much Jennpal! Perfect choices. 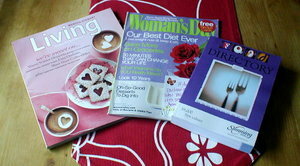 I also received by latest internet buy - the Slimming World Food Directory. This book tells me all the syns in branded foods so I can introduce more into my daily eating plan (ermm, good or bad? ), Super fast delivery on this as I only paid for it yesterday afternoon and received it early this morning - wow! I am really bad at getting in here to blog lately. Same old story...too much work not enough 'me' time. I've been tagged too by Wendy, which I am excited about but I need to find time to do it. 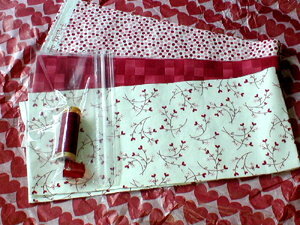 The postman brought me two swap packages this week, from Flibbertygibbet's January strip swap. I am delighted with them! what a lovely parcel! 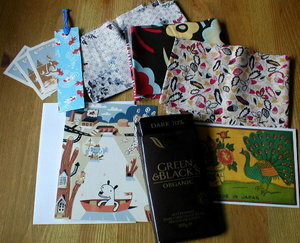 lots of gorgeous goodies including 3 wonderful fabric strips, G&B's CHOCOLATE (yum) a lovely little bookmark which I am using now, a card and postcard - thanks sarah! Thank you so much to Flibbertygibbet for organising this swap - I loved it! Are we having another soon?